CHICAGO, IL, 2018-Apr-05 — /Travel PR News/ — The Department of Cultural Affairs and Special Events (DCASE) is pleased to present Alexis Rockman: The Great Lakes Cycle organized by the Grand Rapids Art Museum (GRAM) at the Chicago Cultural Center (78 E. Washington St.), June 2–October 1 in the Exhibit Hall, 4th Floor North. The free admission exhibition is a multi-faceted project that explores the past, present and future of North America’s Great Lakes – one of the world’s most emblematic and ecologically significant ecosystems. The Great Lakes are one of the most important natural treasures in the world, holding 20 percent of the earth’s fresh water and forming an interconnected system that is among the most beautiful, economically significant and ecologically complex regions on the planet. The works in the exhibition are based on Rockman’s extensive research, travel within the region and conversations with environmental scientists, historians and Great Lakes specialists. 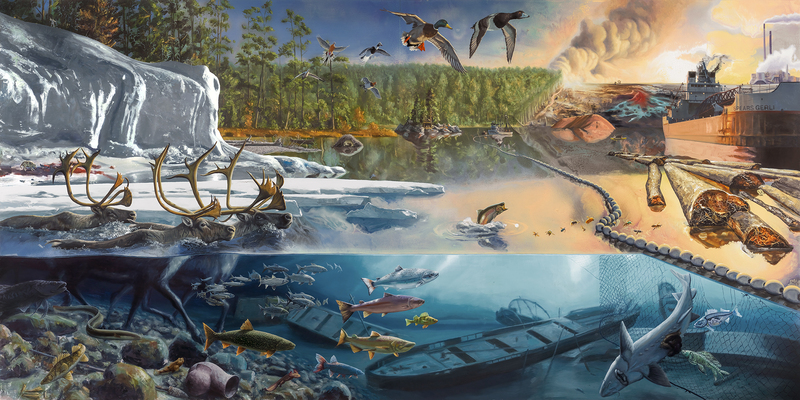 Alexis Rockman: The Great Lakes Cycle is a multi-faceted project anchored by five mural- sized (72” x 144”) oil paintings, each exploring a theme that emerged during Rockman’s field research and engagement with Great Lakes experts. The exhibition also features a selection of approximately 30 field drawings created from organic materials collected at various Great Lakes sites, including key flora and fauna in the ecosystem, invasive species and those under threat of extinction. Completing the series, a collection of six large-scale (72” x 52”) vibrant watercolors offer an unexpected, immersive point of view. Born and raised in New York, Rockman is known for his critically acclaimed, ecology-based works of art included in public and private collections worldwide. His work has been shaped by a lifetime interest in nature, and has found inspiration in explorers who immersed themselves in the wilderness and recorded their observations in notebooks and publications. The artist’s large-scale panoramic works are influenced by the history and practice of scientific representation, as well as methods of historical and contemporary artistic expression, drawing inspiration from 17th-century Dutch still lifes and 19th-century American landscapes. The exhibition’s suite of five oil paintings are the centerpiece of the exhibition, highlighting themes Rockman identified through his research: “Pioneers” focuses on the water itself and the aquatic life therein; “Cascade” examines the history and effects of human activity; “Spheres of influence” looks at the relationship of the atmosphere to the water; “Watershed” considers the land around the Lakes and its impact on the ecosystem; and “Forces of change” reflects on the challenges and opportunities of recovery in the post-industrial age. Rockman’s rich imagination and narrative gift enhance these panoramas as they reveal timelines of geology, climate and human history related to the Great Lakes, beginning with the Pleistocene Era, passing through the centuries to humanity’s present relationship with the Lakes, and looking beyond to a vision of their future. Alexis Rockman: The Great Lakes Cycle was organized by GRAM, complemented by the Museum’s commitment to enriching dialogue and environmental sustainability, and reinforced by its proximity to Lake Michigan, the exhibition will tour the Midwest, traveling to the Chicago Cultural Center on June 2, then on to the Museum of Contemporary Art Cleveland, the Weisman Art Museum in Minneapolis and additional venues. The Chicago Cultural Center, 78 E. Washington Street, is open Monday–Friday, 10am–7pm, Saturday–Sunday, 10am–5pm; closed holidays. Admission is FREE. For the latest news and events, visit chicagoculturalcenter.org, like us on Facebook and follow us on Twitter and Instagram@ChiCulturCenter. Nina Chanel Abney: Royal Flush is the first solo exhibition in a museum for the Chicago-born artist. The exhibition is a 10-year survey of approximately 30 of the artist’s paintings, watercolors and collages. Abney, born in 1982, is at the forefront of a generation of artists that is unapologetically revitalizing narrative figurative painting, and as a skillful storyteller, she visually articulates the complex social dynamics of contemporary urban life. The exhibition is organized by the Nasher Museum of Art at Duke University and is supported in part by an award from the National Endowment for the Arts to the Nasher Museum of Art at Duke University. Chicago-based artist Duk Ju L. Kim was born in Busan, South Korea and spent her formative years in Tehran, Iran. The historical, geopolitical, and current events that shaped her early life and her perception of the world are present in her paintings. Cities lie in ruins, layers of psychological, architectural history pile up and human figures take on the structure of buildings–appear amidst the rubble. The exhibition of sculptural ceramics presents work with sensuous possibilities. The deft handling of material and skillful glaze technique is created by the palms but executed at the back of the mind. The “fluttering inventions” mingle experience with emotions, touching on the real, aware of the historical moment but un-consumed by it. The objects are fluid, electrical, absurd, theatrical and existential…with wild lone beauty. The abstract and conceptual works by Cleveland Dean are presented through a wide range of prosaic materials executed in mixed-media on panels and sculptures. The charred and highly reflective surfaces, grids, wood, cement and resin create tension-filled objects that invite the viewer to reflect into their own psyche and remind them that they are greater than they may believe. Connecting people through art, creativity and design. The Museum is internationally known for its distinguished design and status as the first LEED® Gold certified art museum in the world. Established in 1910 as the Grand Rapids Art Association, GRAM has grown to include more than 5,000 works of art, including American and European 19th- and 20th-century painting and sculpture and more than 3,000 works on paper. Embracing the city’s legacy as a leading center of design, GRAM has a growing collection in the area of design and modern craft. For more information on GRAM, visit artmuseumgr.org or call 616.831.1000. This entry was posted in Arts and Culture, Entertainment, Festivals and Events, Travel, Travel Marketing, Travelers and tagged Alexis Rockman, Chicago Cultural Center, Department of Cultural Affairs and Special Events, exhibition, Grand Rapids Art Museum. Bookmark the permalink.